How often are we adding new companies? We are adding new companies every 1-3 weeks. Follow the "LAST CHANGES date on top of the page in proper category, so you can check is your company added or not. Why to send GPS coordinates too? Your location on the map will be visible. If we don't have your GPS coordinates, then this map will be automatic search of the address. This automatic search sometimes is not showing correct location. If you send us Your GPS coordinates, then you can be sure, that location of Your company will be 100% correct. How to find Your GPS coordinates? 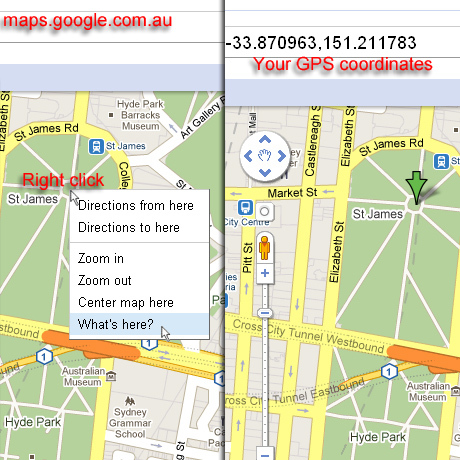 Find your location on maps.google.com.au. Right click on the location, then on "What's here". Your GPS coordinates will appear in search field.